A notorious "snake scam" has slithered its way into San Mateo, Fremont, Hayward, Union City and Burlingame, where police say people are posing as city employees looking for dangerous snakes on the loose to make their way into people's homes and in some cases steal from them. 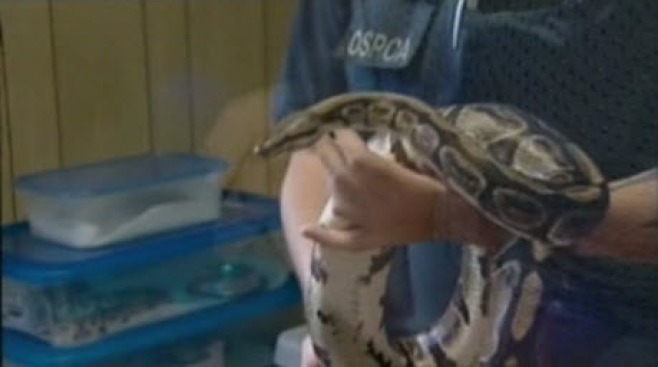 In one case, police in Hayward say $17,000 was taken from a homeowner who let the "snake charmer" in. In Fremont, police are looking for a pair of people posing as animal control officers in search of venomous snakes, who then slipped into a homeowner's backyard and made off with cash and jewelry. Police in these Bay Area cities are now trying to figure out if the snake scammers are working together and if the cases are related. In one of the most recent cases, Burlingame police on Thursday said that a resident on Francisco Drive, behind Burlingame High School, contacted them to report a woman claiming to be an animal control officer came to his home Tuesday around 6:50 p.m. and told him she needed to check his backyard for snakes. While the man escorted the woman to the yard, another suspect entered the home and stole the man's coin collection, according to police. Two Bay Area police departments are investigating reports of robbers posing as Animal Control workers, ringing door bells, warning of poisonous snakes and then taking cash and valuables. Marianne Favro reports. The resident told police the woman spoke loudly and frequently in a "Bronx"-type accent. The resident suspected she might have spoken in this manner to cover up the sounds of her accomplice breaking into the home. The woman was last seen walking south on Rollins Road. She is described as a heavyset Latina with bleached blonde hair tucked into a baseball cap. She stands about 5 feet, 2 inches tall and was wearing a khaki uniform with dried glue stains. Two days earlier, on Tuesday, around 4:50 p.m., San Mateo police received a similar report of a woman posing to be a city of San Mateo employee working for pest abatement. The woman told the homeowner, who lives in the 400 block of Alameda de las Pulgas, that she needed to check the inside of the home for a possible infestation and then the outside to set snake traps. The woman was wearing a tan uniform and had a hat covering her blonde hair. She stood 5 feet 2 inches and weighed approximately 120 pounds. She was estimated to be about 30 years old and had a nose ring. The burglary scam is a new trend where a two-suspect team uses a distraction technique to gain access to the home by one suspect while the other suspect occupies the victim. Although nothing was taken from the San Mateo home, Police Sgt. Dave Norris said that all local agencies that have had similar cases are sharing information and communicating with one another. NBC Bay Area showed a police sketch from the Union City case to a San Mateo woman, who asked not to be identified, on Thursday night. That woman said she was almost certain it was the same person who knocked on her door on Sunday. "She had a cap on and she had short hair on the side which were blonde yes," the homeowner told NBC Bay Area. The suspect told her she was from the city of San Mateo Animal Control and said there were snakes loose in the neighborhood, and that she needed to check her kitchen drawers and under the sink to take measurements. The woman says the thought of snakes scared her and she let her guard down, allowing the stranger into her home. "She looked under my kitchen sink, but then she was talking in her lapel to someone and it wasn't in English. And she just kinda stood there. And I said don't you want to look in the drawer. And she said...uh..okay," the homeowner said. That was the first of several red flags. The homeowner says she did not see an official car outside and the suspect's badge did not look authentic. But the final straw was when the "Snake Scammer" ordered the family out of the home and into the backyard. "I had a son who was sick in bed and I didn't want to bring him down. And she insisted he come down and I protested and I thought this is really odd why she's insisting my sick son should come down," the homeowner said. The homeowner had had enough and asked the suspect to leave her home, which the "Snake Scammer" did without a fight. Neither the Burlingame Police Department, San Mateo Police Department nor the Peninsula Humane Society are investigating any infestations of snakes or snake-related problems in Burlingame and San Mateo. Fremont animal control officials also report that they are not looking for any loose snakes or handling snake-related problems in the city. Animal control officers and police officers are required to carry with them governmental photo identification cards. Police are advising residents to ask to see photo identification of a person claiming to be an officer. Beware of solicitors at your door, as this is a common ruse to see if anyone is home, according to police. Residents who see suspicious activity are being urged to contact police immediately.